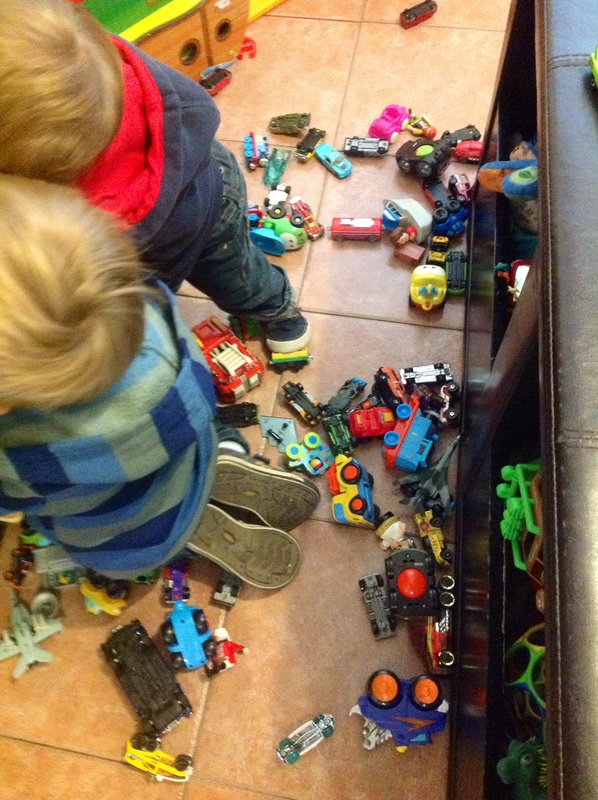 Life with two boys under the age of three is particularly messy. I’m giving you fair warning…. If you enter my house, watch where you walk. At any time there many be dozens of toy cars strewn across the floor, a halfway dismantled train track off to one side, a number of half built and mostly knocked over towers in the middle of the rug, books strewn across the table and couch, and any number of pretend food items, plastic tools, stuffed animals and toy doctor’s instruments found under the table, between the couch cushions and wherever you least expect them. Life in Mexico is messy. Living in large cities (Brooklyn, NY and now Mexico City) I have found that we just track in extra dirt. Cities are dirty. When you are walking outside a lot that dirt tends to get tracked into your home. Homes in Mexico tend to be “well ventilated.” There’s a good sized space under my front and back door through which I can clearly see the light of day. Our windows are not double pained or thoroughly sealed. There’s no fan in the bathroom, so we keep in window open most of the time. Dirt finds it’s way into my house on a constant basis (and bugs, lots of bugs…I’ve grown well acustomed to handling the spiders and rolly-pollies, but the scorpions still make me shudder ever time). Recently we had an issue with our roof leaking in our extra bedroom and this has added a whole extra level of messy. My life is particularly messy right now. I’m working on not just tolerating it in short spurts, but finding a way to actually embrace it (I’m not there yet). I like things clean and neat. I just went through, sorted and organized some of my younger son’s clothes. I’m not sure a person is supposed to get the amount of joy and relaxation that comes to me when I complete such a task. Proverbs 31 describes an excellent wife, the kind of woman I strive to be, and the closest thing I can find in this description is found in verse 27: “she looks well to the ways of her household and does not eat the bread of idleness.” However, the rest of the passage describes looking after her household as providing them with food, clothing, and the ability to trust and respect her. It says nothing about her cleaning and organizing duties. So, I’m working on learning to let go a little. This is not to say that I’ve stopped cleaning my house, that the toys don’t get picked up at the end of the day, or that I don’t still have my occasional freak out over the shear volume of mess. But caring for my family and my own character have to be of greater value. Sometimes it’s more important to stop cleaning and sit the the middle of the mess and just be with my kids and my husband. The mess is part of the journey.